Colorful countries flags rose up in the sky with pride as hundreds of people walked in the Wanganitie grounds where the official opening of the World Outgames III in Antwerp, Belgium took place. The anticipated 20,000+ participants from all over the world had arrived and looked ready to partake in different sporting events. 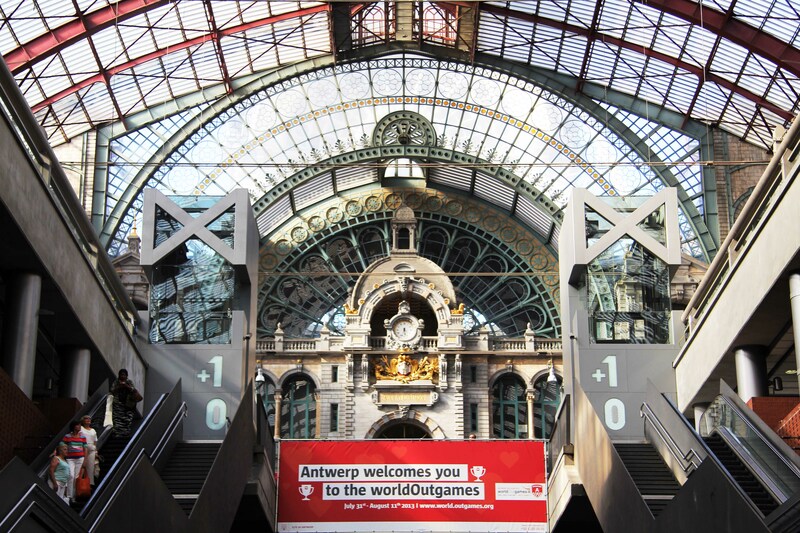 The WOGA banner at the Antwerp Central station. According to the chairman of WOGA over 100 countries registered to participate in the games and 20,000 people were expected to be part of the WOGA 2013. However, with such staggering statistics only a handful of South African athletes are in Antwerp and among those only one black lesbian is visible. We, as Inkanyiso are here to document since it is our ritual to cover such events and surviving through private funding. Dikeledi Sibanda who is a member of Forum for the Empowerment of Women (FEW) and a team player of Chosen FEW, the only out black lesbian soccer team in South Africa was there to represent South Africa from Johannesburg. Though one would wonder how is that possible for only one teammate to come all the way to represent in sport activities without the whole team. I mean it is a known fact that a soccer team is made out of 13 players inside the field. Sibanda came all the way from Johannesburg to Antwerp alone to represent her team; this is due to the fact that the entire team that was invited could not raise enough funds for travel expenses to the host city. According to Sibanda, the team was awarded an outreach package; however, the outreach condition was that the team had to pay for their travel expenses and visa cost and when they got to Belgium they would get refunded. The outreach that Sibanda is talking about was given to most participants of the Outgames, however it had different reservation as some teams which were awarded the same outreach, their flight tickets were purchased for by the organisers of the Outgames. Sibanda realized this when she asked some of the participants she’s sharing with where they went to get their refunds, and they responded by saying they didn’t have to get any refunds as their travel expenses were purchased by the Outgames organisers. From what Sibanda has shared and from what I have observed I realize that the Outgames favored certain groups to other and this was evident in the manner the whole outreach thing was handled. For the coordinators to expect a team that is managed by an NGO which it self sources funding to function to pay for +-10 people return ticket is absurd. This for me is a form of discrimination to the poor countries, sports men and women who have the talent and will to participate in such event but are unable to because of lack of financial support. At the opening, mostly white participants where visible, and all of those white participants came with their team. I noticed this when countries were introduced on stage; Namibia was called on stage and only one black person came on stage, but when Russia or other European countries were called on stage, a bunch of people filled the stage. Maybe in Russia’s case the reason they had many participants at the Outgames is because of the current political climate regarding the passed law against ‘propaganda of non traditional sexual relations’ of which its understand, but that doesn’t mean other countries should suffer because we want to prioritize a certain country, everyone should be given equal opportunity. The Human Rights Conference that was held on the 31 July to 3 August 2013, took place prior to the Outgames opening was another issue on its own. The conference was dominated by white males and mostly from Europe. As I gazed around the room, I quickly realized that besides me, there were only two black lesbians present at the conference, one South African and a Nigerian. The other black people there were gay men who are from Africa but had since got asylum from European countries, because they feared persecution in their own countries. When the few were on stage recounting their experiences back home I was touched but I thought me as a black lesbian from South Africa, I also have a lot to deal with. South African lesbians are faced with gruesome corrective rapes pandemic, but we are never invited to share our stories, and he only time these issues are only talked about is passing or when another is killed. Even in the conference programme, lesbian issues were not part of the agenda. Everything else was focused on gay men, their health, safety and lively hood. The only talked about topic in regards to African queers was that of asylum seekers who are presumably facing execution in their countries, and sitting there I wondered how many of those asylum seekers are really faced with execution and whether or not their situation is worse that a lesbian living in a South African township? Why aren’t black lesbians flown to these international spaces so they can talk about their experiences? The conference was themed ‘From safe harbours to Equality’, however, to me that wasn’t the case as there wasn’t so much equaliy in race and gender in the jampacked room. Alice N’Kom a Cameroonian Lawyer and founder of an LGBTI organization in Cameroon called Association Pour la Defense De l’ Homosexualite (ADEFHO) gave a powerful speech which painted a vivid picture of what LGBTI individuals and groups are going through in Africa. N’Kom recounted on the recent killing of a prominent Cameroonian gay rights activist and journalist, Eric Ohena Lembembe and briefly on Duduzile Zozo. Lebembembe was tortured and killed in an attack that his friends suspect was related to his activism. He is now counted amoungst many prominent gay activists who have been killed because of their activism. One such case is that of Ugandan Human Rights activist David Kato killed in 2011. N’Kom expressed outraged about these murder and said such killings shouldn’t be accepted. She also urged African activists not to stop the fight for human rights as one day the WorldOut Games will be hosted in an African country. The need for solidarity and allies was echoed throughout the conference but when the final statement/ guidelines taken out of the conference was deliberated and presented, nothing on showing solidarity and creating allies with South African lesbians was said or noted. I have come to notice that in such spaces some issues are more important than others and some people will be sidelined in favour of others. If one doesn’t stand up to be heard, no one will know or care about their grievances. 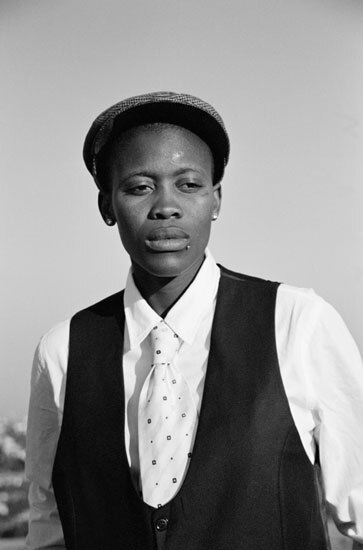 As a young Black South African Lesbian, I realised that our generation needs to be heard and visible in such spaces. We cannot afford to be sidelined at conferences as well as sport spheres. It is our duty to reclaim our stance in political spaces as LGBTI individuals especially at events is a much needed reality. The World Outgames are quardral games born in Montreal, Canada, in 2006. There are more than 18,000 participants from 111 countries as conference delegates, athletes, volunteers or participants in the cultural program. Copenhagen, Denmark was selected to host the 2nd World Outgames in 2009 after a competition with several other cities. Nearly 100 nations represented their countries, and up to 20,000 people were registered as participants of the Outgames in Copenhagen. The third games in Antwerpen promised nothing less but a bigger and better event, however, they stil have a long way to go in making sure that equality is the main roots of such important games. The Outgames goes on in Antwerp till the 11th Aug. 2013. This entry was posted in accommodation and stipend, Activism, Africa, Allies, Another Approach Is Possible, Antwerp, Archived memories, As we are, Chosen FEW absent, Exposure, Expression, Human rights, Lack of Resources, Queer sports, Sponsorships, Writing is a Right, Youth voices and tagged Articles; Report; 2013 World Outgames; Antwerp; Athletes; Sports & Recreation; Homosexuals; Human Rights; Equality; Politics of existence; Geography; Europe; Kopano Sibeko; Lesego Tlhwale. Bookmark the permalink. Six members of the South African team “Thokozani football club” applied for a scholarship to the Outgames. They only could get a registration waiver and 200€ as per diem allowances. Therefore, nobody could go to Belgium. Offering the same financial package for people who come from a short distance (like most European countries) and guys who must endure a much more expensive flight is unjust. It is a way of excluding people from the poorest countries while hiding behind the exxcuse that you want to give the same treatment to all. But people do not live in the same conditions; they do not have the same audience; they do not always share the same problems. We heard back from Z. H., one of the South African players that we helped fill out the application to the WOGA. She told us that you can only provide financial support for the registration and some per diem allowances – which is great in itself, but, as you can probably imagine, utterly insufficient for her to afford to come to Europe. In fact, the major cost for her, and her fellow players, are the flights, which cost around 1000 euros, a huge amount of money for people, like Z. H., who live in townships and are mostly unemployed. We would like to know whether all 6 applications from the Thokozani FC received the same answers. If so, I would like to propose something: instead of giving 6 people a small amount of money, wouldn’t it be better to give a couple of them a full scholarship, including air fares? I know that selecting scholarships is a very tough job, and I am sure that you did your best to have a worldwide balanced representation. Yet, I really think that it would be a major lack for the Out Games not to welcome any black, lesbian South African players to Antwerp, especially as this group is one of the most exposed to lesbophobia in the world and one of the most in need of visibility on an international level, to protect its members. Here’s hoping we can find a good solution for everybody.